Henri Regnault (1843–1871), Summary Execution under the Moorish Kings of Grenada (1870), oil on canvas, 305 x 146 cm, Musée d'Orsay, Paris. Image by Sailko, via Wikimedia Commons. The most famous artist to die in the Franco-Prussian War was the French Impressionist Frédéric Bazille, but he was not the only promising young painter to be a victim of that brief conflict: also killed was Alexandre-Georges-Henri or just plain Henri Regnault (1843–1871). Son of one of France’s most distinguished chemists and physicists, he trained with Montfort, Lamothe, and Alexandre Cabanel, and first competed unsuccessfully for the prestigious Prix de Rome in 1863. His Orpheus in the Underworld (1865) appears to be based on the popular opera by Offenbach, which was first performed in 1858. 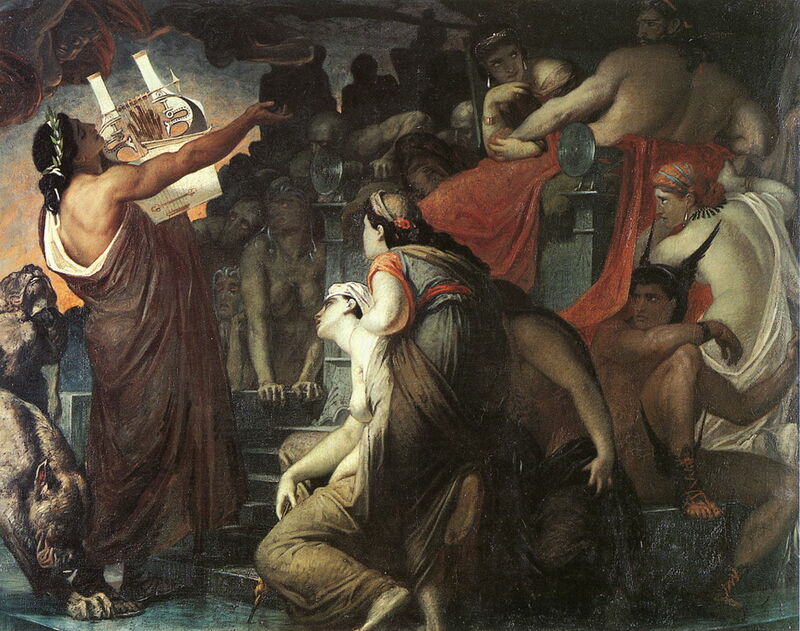 Orpheus is seen at the left, his lyre in his hand, singing to the dead. Behind him, at the left edge, are two of the heads of Cerberus, who guards the entrance to the underworld. Henri Regnault (1843–1871), Thetis Bringing Achilles the Weapons Forged by Vulcan (1866), oil on canvas, dimensions not known, École Nationale Supérieure des Beaux-Arts, Paris. Wikimedia Commons. In 1866, he competed again in the Prix de Rome, and won it with his Thetis Bringing Achilles the Weapons Forged by Vulcan. This set title for the painting was taken from a famous painting, generally known as Thetis Receiving the Weapons of Achilles from Hephaestus, by Anthony van Dyck, from 1630-32. It shows a scene from the story of the Shield of Achilles, drawn from Homer’s Iliad, book 18, lines 478-608. In this, the sea-nymph Thetis, Achilles’ mother, pleads with Hephaestus/Vulcan for replacement weapons for Achilles in the Trojan war, after his original armour and weapons are taken by the Trojans from the corpse of Patroclus. Here, the bare-breasted Thetis brings those impregnable weapons to Achilles. Among them is the famous decorated Shield of Achilles. Henri Regnault (1843–1871), Automedon with the Horses of Achilles (1868), oil on canvas, 315 × 329 cm, Museum of Fine Arts Boston, Boston, MA. Wikimedia Commons. 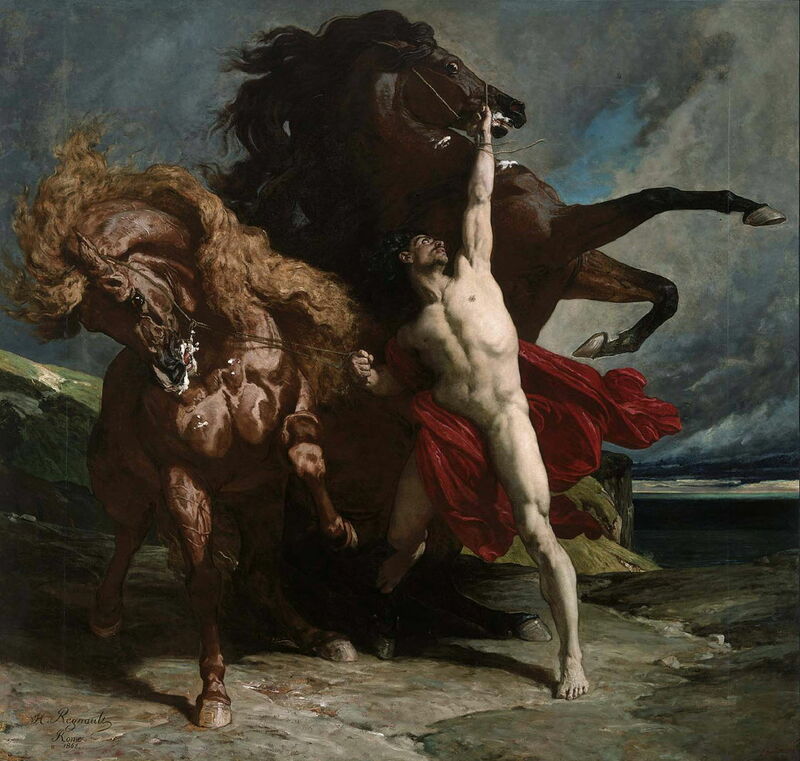 Automedon with the Horses of Achilles (1868) also draws from the stories about Achilles during the Trojan War, in the Iliad. Automedon was Achilles’ charioteer, who rode into battle in command of Achilles’ horses Balius and Xanthos, to support Patroclus, when he was wearing Achilles’ armour. When Patroclus was killed, Automedon was driven to the rear of the fighting, where he tried to console the bereaved horses, as shown here. Oddly, Regnault does not associate the horses’ names with their appearance: Balios probably means dappled, and Xanthus means blonde. 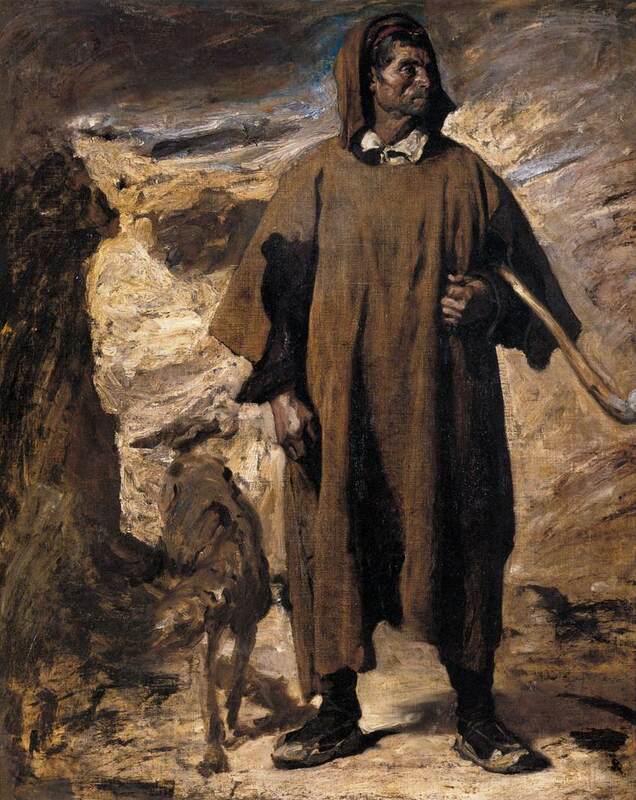 Henri Regnault (1843–1871), Castilian Mountain Shepherd (1868), oil on canvas, 100 x 80 cm, Musée des beaux-arts de Pau, Pau, Aquitaine, France. Wikimedia Commons. Regnault was probably the first winner of the Prix de Rome to be given dispensation to not spend the obligatory three years in Rome. Instead he travelled to Spain and North Africa for the latter years, for example painting this fine realist portrait of a Castilian Mountain Shepherd (1868). 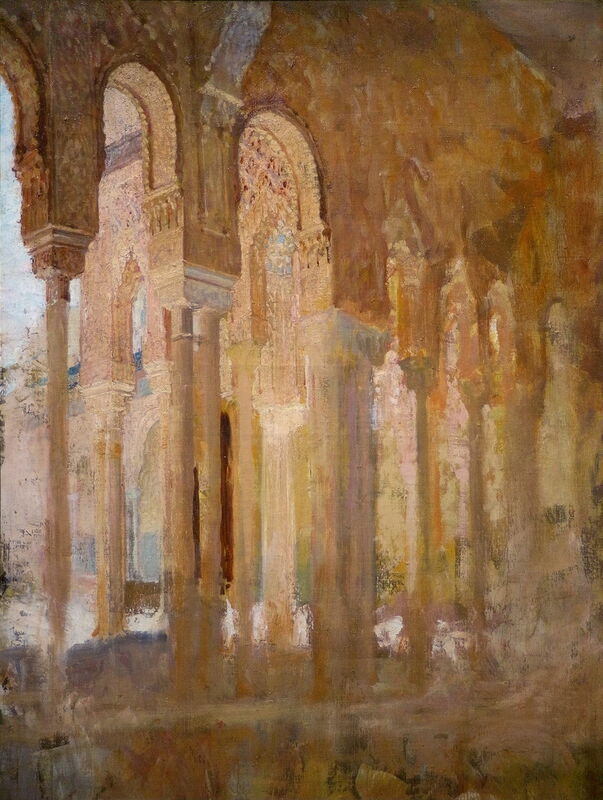 When he was in Granada, he painted this view of the Colonnade of the Court of the Lions at the Alhambra (1869). I suspect that this was unfinished, and that he intended to complete the detail in its lower half. More famous was his Summary Execution under the Moorish Kings of Grenada (1870), which catered for the growing public taste for spectacular gore. This shows the immediate aftermath of a summary beheading performed on the steps of the Alhambra, during the Moorish kingdom prior to the Christian Reconquista of 1492. Regnault uses contrasting colours to great effect here, with the green robes of the victim making his blood seem intensely red. The low angle of the view also enhances the stature of the executioner and gives immediacy. 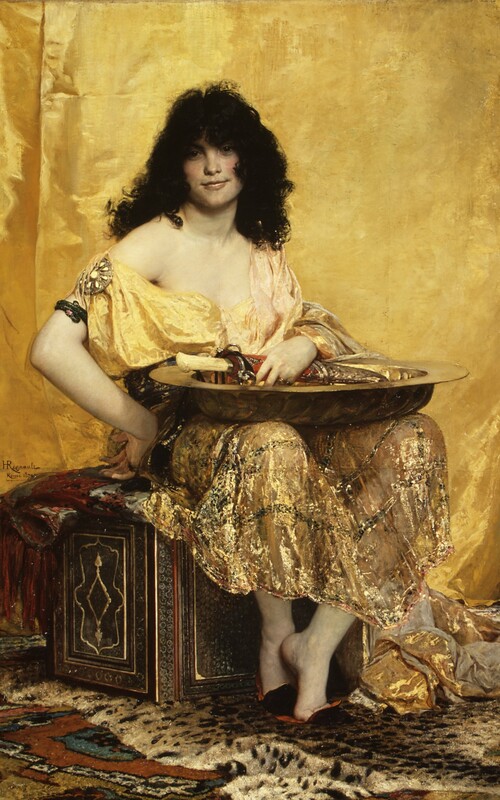 Regnault’s other painting shown in the Salon that year caused even more of a sensation: it was his Salome (1870). Most unusually, Regnault shows Salome alone, equipped with a short sword with which to behead John, and the large platter to contain his head. She is dressed as an ‘oriental’ (North African) dancing girl, and Regnault had originally intended to make her appear North African too. On her face is a knowing smile, of someone who is about to get just what they wanted. Although it questioned the Biblical account, Regnault was careful not to contradict it. Sometimes those who won the Prix de Rome all but disappear. In Regnault’s case, he was clearly destined for much greater paintings in the future, and promised to be just what history painting most needed. Then on 19 January 1871, during the second Battle of Buzenval, near St Cloud to the west of the city of Paris, he was among the defenders and was killed in battle. He was 27. His tragic death was commemorated by other artists who had fought in the war. 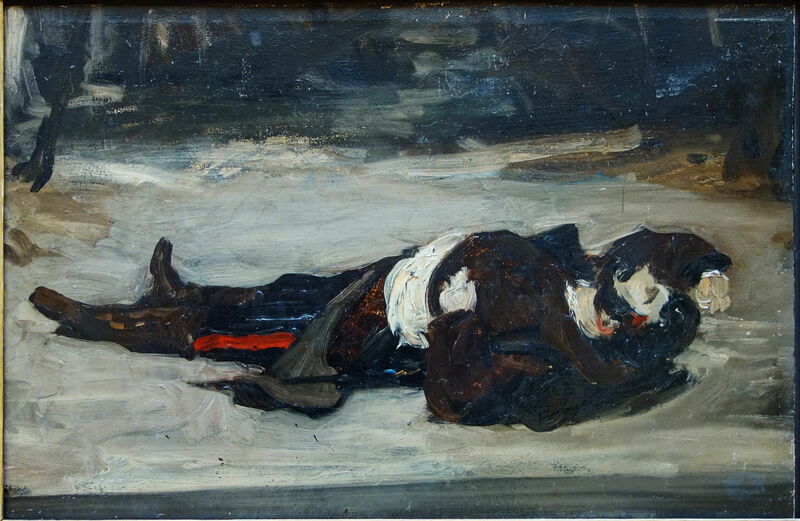 Carolus-Duran, who had fought in the same battle, painted his oil sketch of Henri Regnault Dead on the Battlefield (1871). Jean-Louis-Ernest Meissonier (1815–1891), The Siege of Paris in 1870 (1884), oil on canvas, 54 × 71 cm, Musée d’Orsay, Paris. Wikimedia Commons. 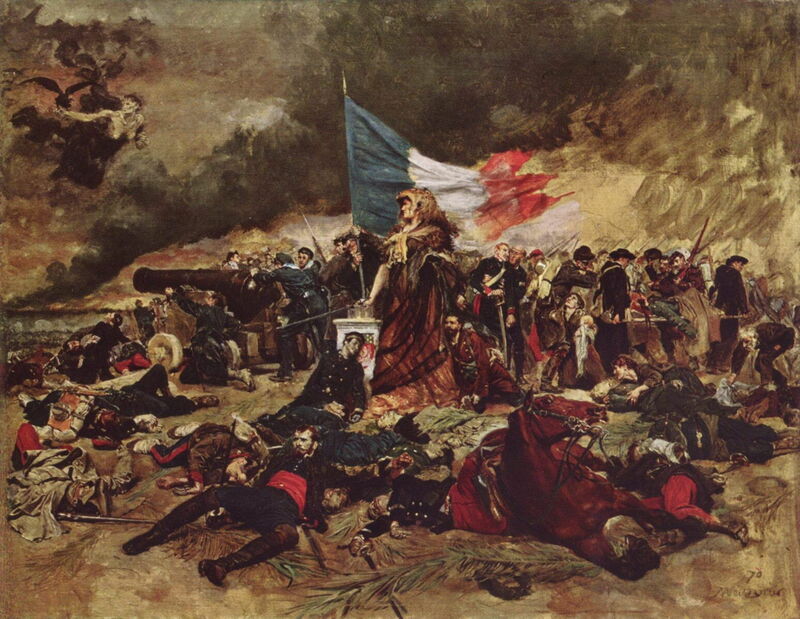 Jean-Louis-Ernest Meissonier, who commanded an infantry regiment which defended Paris during the war, included Regnault as the soldier slumped on the white plinth in The Siege of Paris in 1870 (1884). Camille Saint-Saëns, another veteran of the defence of Paris, dedicated his Marche Héroïque (1871) to Regnault’s memory. Posted in General, Painting and tagged Carolus-Duran, Meissonier, narrative, painting, Regnault, Salome. Bookmark the permalink.